Sure, 1:1 technology is the dream!! But what about when it just doesn't happen? You didn't quite get that grant? Your district just can't afford that many devices? What then? Can you get 4 laptops? 6? 15? I want to start the discussion here. Please be apart of it! How do we implement a 1:Many plan? If you have devices permanently in your classroom that you don't have to check out I'd LOVE to hear from you! How many do you have? What are you favorite activities? Just a quick comment would be great! Or send me a longer email (MrsHestersMath@gmail.com). 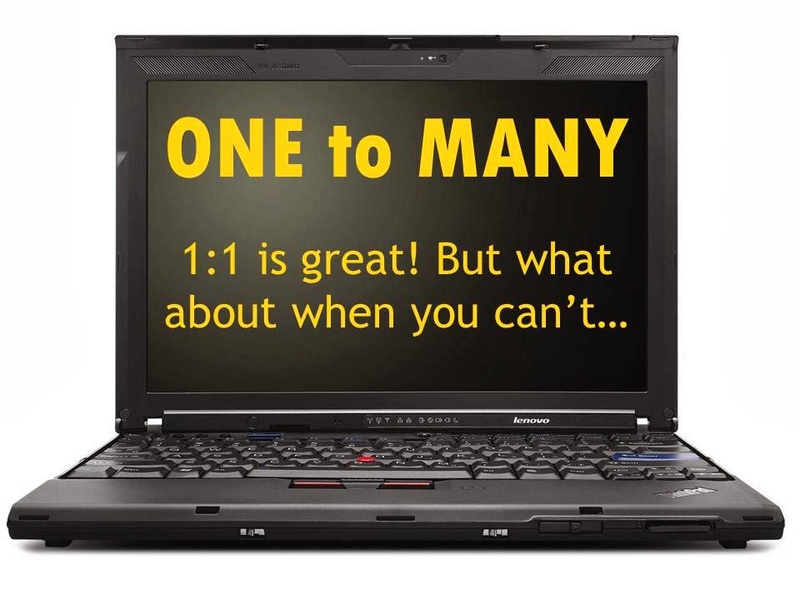 Are you trying to implement 1:1? 1:Many? What's your technology situation? It's only been a day and I have some awesome feedback! I love my online PLN - you guys rock! Please comment below, email me (MrsHestersMath@gmail.com) or tweet me (@MrsHestersMath)! Formative Assessments: get a pulse of the classroom in real time using poll everywhere, socrative, a google form, etc. Do units as projects. Divide students into groups and assign them something to investigate and present. Give a day or two (block schedule) of work time and then allow groups to present. Students take notes on other group's projects. Real-life investigations. Use sites like Desmos to investigate graphs, Mathalicious content for other ideas, Fawn Nguyen, lots of functions/sequences/etc. using visual patters, Dan Meyer 3-act, Emergent Math's PBL curriculums, etc. Student Check-ins. This was a fun emailed-to-me idea where students enter the classroom, sit in groups, and immediately log on to a machine. They pull up a google form (probably through a bitly url) and record who in their group did their homework, what were the most challenging problems, who didn't do their homework, why not, etc. I can see the answers on my machine in real time and discuss the challenging problems. This gives students time to discuss with each other and I can read all responses as they arrive, instead of circulating around the room and possibly missing some responses. Yes, #3 above is a HUGE topic. I realize that. #3 is the ultimate goal of edtech. But realistically I will probably integrate #3 slowly as I do #1, 2, and 4. To do it well, #3 entails an entire re-vamp of instruction and assessment. Something some districts are still working to make progress towards and individual teachers don't have autonomy to make those decisions. Idea #5. Stations. I am so glad Shelley sent me a wonderful email because this idea has been turning around in my head as well. It's so grateful to get to bounce math ideas around with others!! Here's basically what we talked about. Could we pull off running our entire classroom as stations? We both teach in a block setting (~80 minute classes) which is a long time for junior high kiddos to stay still. They need to get up. They need to move around. We've both utilized stations around the room as activities. ...But could we structure our entire classroom as stations???? Kiddos are assigned to a group based on who they work with well. We have four groups of about 6 - 24 kiddos per class on average. Through our email chat we came up with these groups: (1) teacher time: mini lesson, interactive notebook time, etc. (2) work time: basically doing homework (3) remediation and extension: this is where the laptops come in doing remediation through MangaHigh or extension through Daily Desmos or Visual Patterns. (4) still tbd. --1-- What do the kiddos do in "work time" that haven't seen the teacher yet for new material? --2-- What should station 4 be? We tossed around a few ideas but nothing stuck. Are we forgetting some integral portion of a mathematics classroom? I have 60 minute classes which are so short to do stations, but I still try to do them. Let me know what you think or if you have other ideas!